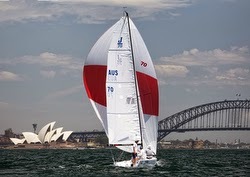 More J/70 news from Australia! 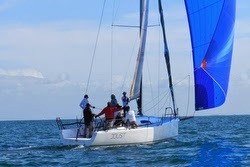 (Sydney, Australia)- It seems that Tim Ryan’s J/70 JAMES 007 has just won the CYCA Div E Winter series. And, this took place whilst Tim and the rest of the normal crew were in La Rochelle for the J/70 Worlds! Despite not being on board, Tim Ryan was thrilled that his J/70 JAMES 007 won Division E victory in the hands of friend Peter Ryan. 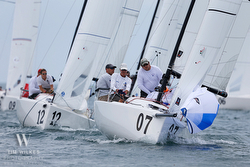 It gave them a clear four-point victory over Jonathan Green's Melges 32 Crusader. Coming in to the day, Crusader, JAMES 007 and Skeeter were on equal 21 points, with Tigger one point behind. 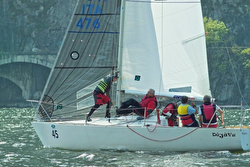 Sandor Tomai's Farr 30, Skeeter, ultimately finished third overall on countback, while Tigger maintained fourth place, in this hotly contested division. Tim Ryan said from France: "I entrusted the boat to Peter Ryan (no relation to Tim) to skipper the boat. I'm in La Rochelle in France to sail in the J70 Worlds - please give him my congratulations." SMOKE & MIRRORS Fiesta Cup Winner! 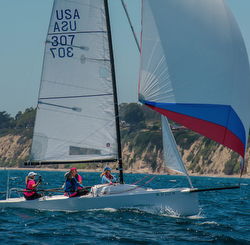 (Santa Barbara, California)- The 9th annual Fiesta Cup took place on July 17th to 19th at Santa Barbara Yacht Club. 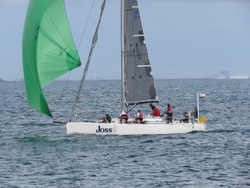 Due to somewhat challenging sailing conditions that were due to the remnants of a Pacific typhoon that originated off Mexico, the J/70 class were just able to squeeze in a regatta with just three races for the entire weekend! (Freemantle, WA, Australia)- “Onboard our J/122 JOSS, we opened our Valmadre Cup campaign with 2 top 3 placing’s– leaving the skipper and crew in a state of happy disbelief as it was only our second Valmadre Regatta and JOSS’ first IRC State Championships. To walk away with a 1st Place in Division 2 YAH and 2nd Place in the Div. 2 State IRC Championship was a fantastic start. Like many yacht’s JOSS had been struggling all season to find regular crew for river and offshore races. Therefore, before the start everyone was extremely nervous as to how we would perform, as most of the crew had never sailed together. The conditions were definitely exciting, with a nice strong consistent 15-20 knot breeze, and a moderate 1-2 meter swell clearly designed to test all 50 yachts competing in the 4 Divisions in terms of their crew teamwork & overall race strategies. Our strategy was simply to sail fast, occasionally sailing a little lower then most of the fleet, making sure our trim and boat handling wasn’t sloppy in the choppy conditions. We didn’t try and take an aggressive start, simply wanting to come in fast near the boat end of the line, and find a nice gap. With plenty of breeze and clear air, we managed to maintain good boat speed on the long beat towards the top mark with the whole fleet sailing close together. Our decision to compromise height for speed paid off and allowed us to round Fairway Buoy in a very good position. We hoisted our “Big Green” asymmetric kite as soon as we rounded the top mark (with a big sigh of relief as it set absolutely perfectly). Our luck was short lived, the tack line soon snapped sending the crew scrambling to quickly drop the kite and attach it directly to the bow sprit, it was re-hoisted quicker than Usain Bolt ran the 100 meter sprint at the last Olympics. JOSS made good gains downwind, ensuring that we were at the front of the fleet following close behind Giddy Up & Just Cruising. From then, on the crew worked brilliantly – managing to gybe, drop, hoist, and tack throughout the race without any compromise to our boat speed and managing to pass Just Cruising. On the final leg towards the South Mole finish we set our sights on the lead Div 2 boat Giddy Up who sailed a fantastic race crossing the line 3 minutes in front, just enough to secure them a well deserved and adjusted IRC lead of 23 seconds. JOSS finished 2nd on the water in Div 2 in a time of 4 hrs 15.49 minutes, and as a result managed to take out 1st Place in the YAH opening Valmadre Race. A big “thanks” to the Fremantle Sailing Club for hosting a wonderful day as well as the 18 boats in Div 2 whom all sailed an exciting and challenging opening race. (Mandello del Lario, Italy)- The fourth stage of the five race Italian J/24 National Championship series took place on the eastern end of Lago di Como in northern Italy. 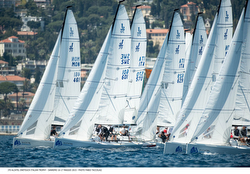 The event was hosted by the Leggio Navale de Mandello del Lario and it also commemorated a famous Italian Star sailor. The “breva” wind blew generously across the lake and allowed a nice long windward-leeward course to be laid out by the RC’s PRO Alberto Zerboni. After four races were completed over the weekend by the dozen J/24s, the victory for this stage went to DEJA VU sailed by the J/24 del Lario Alfio fleet captain- Ruggero Spreafico. DEJA VU’s scoreline of 4-4-1-1 for 10 pts was just enough to win over Marco Stefano’s GRIFFON KONG team that posted a 1-6-2-2 for 11 pts to take the silver. Third place went to BRILLANTE sailed by Pierluigi Puthod, who managed to post a 5-1-5-4 for 15 pts total. After four events and sixteen races to count so far in the Italian J/24 National Championship series, DEJA VU is currently leading with 22 pts, followed closely by SPLENDIDO with 23 pts. Then, in third is GRIFFON KONG with 25 pts, fourth is Sergio Agostino’s BRUSCHETTA with 61 pts and fifth is Marzio Tavecchio’s ELSA BORN FREE with 63 pts. (Newport, RI)- With all the regattas that populate the summer sailing schedule in Newport, RI, it’s a surprise to find there’s any kind of a hole between Memorial Day and Labor Day. In fact, however, the odd years had little competition for larger, handicap yachts after the New York Yacht Club Annual Regatta presented by Rolex in early June. Therefore, the New York Yacht Club’s Sailing Committee decided to fill the gap with a mid-season IRC regatta. Both four-day events were run out of the New York Yacht Club at Harbour Court and finished up on Sunday with all fleets sneaking a single race into a day marred by a very persistent fog bank. Despite being a last-minute addition to the schedule, the 2015 IRC East Coast Championships proved its worth by pulling in 26 boats from 30 to 55 feet. Equally as impressive was the variety of designs and ages of the yachts that competed in the event, from NYYC Rear Commodore Bill Ketcham’s J/44 MAXINE (build in 1989) to the brand new IRC/HPR custom machines. "I think the biggest success was the participation we had," said event chairman Art Santry. "We had 26 boats and we did not have much time to get it organized and get the word out. I think the second biggest success was if you looked at the types of boats that did well, it was pretty varied. That's a testament to PRO Sam Wakeman, who put together the courses. It wasn’t strictly windward-leeward, it was a lot of different stuff that worked out for everybody." The IRC 2 class saw spirited competition for the top three slots. It wasn’t until the final two races that the top three was determined. Finishing just three pts from first, NYYC Rear Commodore Bill Ketcham’s J/44 MAXINE from Greenwich, CT took third place and even collected two 1sts and two 2nds along the way and, in fact, had by far the best last five races in their fleet- averaging a 2nd place! 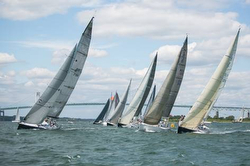 (Newport, RI)- Featuring four coastal race courses between 104 nm and 177 nm, the Ida Lewis Distance Race is the perfectly designed overnighter for IRC, PHRF, One Design, Multihull and Double-Handed boats of 28 feet or longer. Its round-trip course starts and finishes off the historic Ida Lewis Yacht Club and includes turning marks at Castle Hill, Brenton Reef, Block Island, Montauk Point, Martha's Vineyard and Buzzards Tower. Both grand prix racers and cruising sailors have come to love and embrace this August tradition, which also offers special trophies for a Youth Challenge and Collegiate Challenge. J/36 JAZZ Round Island Report! “We left Plymouth on Thursday before racing on Saturday, covered 130 miles to the Needles on the westernmost point of the Isle of Wight. It was just two of us, Charles and me. We sailed about 9.5nm out of the way and picked up “Alie” at the marina in Cowes— he’s Charles’ son. We got to the start line Saturday morning at 0730 hrs. We went well to windward, passing lots of boats until we got to the Needles. My crew did not have a lot of kite experience, so we left them in their bags. Consequently, we lost a lot of time down the back of the island, past St Catherines Point, all the way down to Bembridge Ledge and sailing back through the Forts. (Erie, PA)- The Lake Erie Interclub is a five-day regatta “cruise” organized and hosted by the Buffalo Canoe Club, Buffalo Harbor Sailing Club, Buffalo YC, Erie YC, Port Dover YC, Dunkirk YC and the Sugarloaf Sailing Club- all clubs located at the far eastern end of Lake Erie and not far from the famous Niagara Falls. The event consists of with 3 port-to-port races and 2 in port races: #1- Erie Course Race, #2- Erie to Port Dover, #3- Long Point Bay Course, #4- Port Dover to Port Colborne, #5- Port Colborne to Point Abino. In fact, the J/35s in PHRF B class nearly swept the podium, with stablemate POISON IVY II helmed by Jim Kondziela taking 2nd in class and 5th overall in fleet and Bill Hertel’s MAGIC taking 4th overall, just 2 pts out of third! Fast & Furious Bayview Mac Race! J/111 UTAH Takes Doublehanded Class! 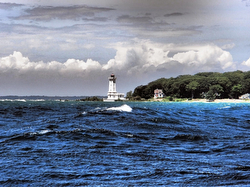 (Mackinac Island, MI) – According to Chairman Peter Wenzler, who sailed aboard Bill Alcott’s (St. Claire Shores, Mich.) 65-foot Equation, a “white squall” hit the fleet shortly after the start, making a whole lot of wind out of what started as a light downwind breeze. While some spinnakers became streamers at the tops of masts, others were locked and loaded or temporarily switched out for easier-to-handle headsails before the wind calmed and then elevated again to a more sustainable and “for the most part wonderful” 22 knots over flat, waveless water. 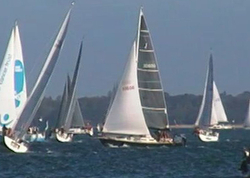 The bigger boats sailed the 259 nm Cove Island Course while the smaller boats sailed the 204 nm Shore Course, with both courses finishing at Mackinac Island. The bigger boats enjoyed a strong beat home in 18-22 knots after turning the corner at Cove Island. The bulk of the Shore Course fleet enjoyed a mid-morning finish today, reaching in a solid 20-25 knots. “From 5:45 to 8:00 a.m., there was a cannon going off every few seconds, as they came in fast and furious,” said Wenzler. Some of the big J/Boats relished the Cove Island course after a sleigh-ride to the turning mark off Georgian Bay in Canada and heading west to Mackinac Island. Near the top of Class B Racing in 3rd was the J/145 VORTICES skippered by Chris Saxton from Bayview YC. Not far off the pace in 6th was the J/44 SAGITTA sailed by Jon Somes & Larry Oswald from Bayview YC. Then, in 14th was the J/133 SIROCCO 3 sailed by Bob Klairmont of Chicago YC. Also taking the long way to Mac was the ten-boat J/120 class, sailing as Class C One-Design. Topping all comers and upsetting the possible Bayview YC sweep was the crazy team on IHNSANITY led by the duo of Marvin Ihnen and Kenneth Tanner from Crescent Sail YC. The next four spots were BYC teams, taking 2nd was Mike & Bob Kirkman’s HOT TICKET; 3rd was class leader Frank Kern on CARINTHIA; 4th was VICTRIX’s Curtis Kime; and 5th were the Ed Vermet & John Hughes on the infamous NAUTI BOYS. Sailing lights out after finishing the Super Mac this year (yes, the one that starts in Chicago, finishes one stage at Mackinac Island, then continues to another finish at Port Huron, MI for 635nm in total), Brad Farber’s J/111 UTAH from Macatawa Bay YC won Class F- Doublehanded! 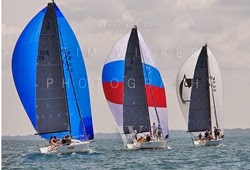 Not surprisingly, the Level 35s sailing in Class G Racing were pretty much dominated by top Great Lakes J/35 teams. And, as a past Bayview Mac champion innumerable times, it was yet again Bill Wildner’s MR BILLS WILD RIDE from North Star Sail Club that took class honors in style and with the most awesome music lists going from 8 mile in Detroit! Second was MAJOR DETAIL sailed by Bill Vogan from Port Huron YC; 3rd was Greg Whipple’s WHIPLASH from Tawas Bay YC; and 4th was the ubiquitous TIME MACHINE skippered by Robert Gordenker from North Cape YC. Similar to their J/35 stablemates, the J/105s nearly swept Class J Racing, taking 4 of the top 5 positions. Leading everyone home was WINDSHADOW helmed by Jim Murphy from Bayview YC. Following in their tracks in second place was Mark Denuyl’s GOOD LOOKIN from Port Huron YC, then in 4th was Don Harthorn’s SNAKE OIL from Lake Shore Sail Club and 5th was last year’s winner- PTERODACTYL skippered by Mark Symonds from Grosse Pointe YC. In their first major offshore outing on Lake Huron was the J/88 SARALYSIA sailed by Chester Kolascz from Bark Shanty Sail Club; their 6th place was most excellent considering their team was still in “learning mode- part I” in some pretty demanding sailing conditions. 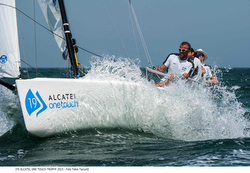 (Cervia, Italy)- L’ELAGAIN owned by Franco Solerio, along with assistance from Daniele Cassinari on tactics, took overall victory in the third leg of the J/70 Alcatel OneTouch Italian Trophy held in Cervia from 12th to 14th June. The event organized by the local Yacht Club in collaboration with the J/70 Italian Class saw the national fleet and Mikael Lindqvist’s ROCAD RACING from Sweden completing 9 windward-leeward races over three days. The water off the pleasant Adriatic coastal resort served up near perfect conditions with Southerly breeze ranging from 12 to 16 knots. Franco Solerio on L’ELAGAIN finished first and second in eight of 9 races, claiming his second stage victory one day in advance. Second Place went to CALVI NETWORK owned by Carlo Alberini, tied with equal points in third with Pietro Saccomanni’s SPIN ONE. SLINKY (J/70) & LOU LOU (J/105) Triumph! 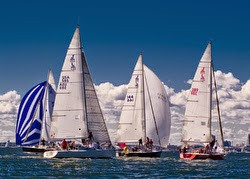 (Larchmont, NY)- Larchmont Race Week got underway on July 11-12 with the second half held July 18-19 to complete the 117th edition. Returning this weekend were the racer/cruiser division and the one-designs. All fleets enjoyed the continuation of competitive racing in a 3-5 knot southwesterly breeze on Saturday and a late-filling 6-12 knot southwesterly on Sunday. Thirty boats sailed on the cruising course with 18 in the PHRF spinnaker division and 12 in the non-spinnaker group. Three races were completed in each fleet. This weekend also included a distance race around Execution Light on Sunday, an event new to the Race Week format. 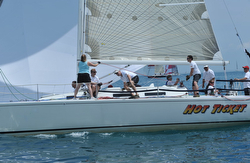 "The addition of the distance race to the Race Week format added some fun and variety," noted Cruising circle PRO Jed Kelly. One-design PRO Nick Langone was able to run seven races for the fleets. Winning the nine-boat J/105 fleet was Paul Beaudin from Harlem Yacht Club on LOU LOU. 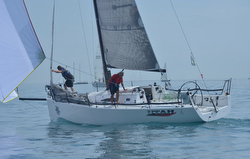 Jeremy Henderson and Harald Edegran's CONUNDRUM and the American YC Jr. Big Boat Team's YOUNG AMERICAN rounded out the top three. Fourth was George & Alex Wilbanks REVELATION and fifth was the Larchmont YC Jr Offshore Team on PRIVATEER. At this rate of development, it may not be long before the two junior offshore teams will be consistent “players” for the podium in the future! Scott Bursor’s SLINKY overcame a slow start in the thirteen-boat J/70 fleet to win by a comfortable margin. Sailing faster and smarter all the time are the two Ploch sisters (Madelyn & Megan) on SUGAR DADDY; after winning the first race they hung on to grab the silver. Third was Ernest Bourassa’s ALTHEA followed by Dave Florence’s BUZZ in fourth and Dan Goldberg’s BAZINGA in fifth. In the PHRF handicap division, the J/120 SUNSET CHILD skippered by Marcus Cholerton-Brown took third place in PHRF Racing Class. And, after having to count a DNC in the first race, Carl Olsson’s J/109 MORNING GLORY booked a 3-2 to secure 5th overall for the series. Taking sixth was Chris Clarke’s J/32 QUEST. (Perth Amboy, NJ)- The Raritan Yacht Club of Perth Amboy, NJ hosted their 69th annual Red Grant Regatta on July 11-12 as part of the yacht club's 150th anniversary celebration. The regatta hosted 56 boats including nine J/105s and nine J/109s, along with several PHRF spinnaker/non spinnaker and cruiser classes. The weather was typical summer conditions for Lower NY Harbor/Raritan Bay with warm temperatures and light breezes of 5-8 knots. Bengt Johansson and the crew from ZIG ZAG won a very tightly contested J/109 East Coast Championship. 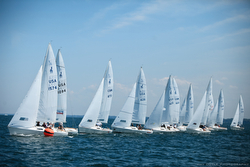 Nine boats from New England, Long Island Sound, Chesapeake and New Jersey raced in the regatta. Both days had a light Southeast breeze in a strong cross current. After about an hour postponement on Saturday the race committee managed to get two races off before the wind dropped below 3 knots. Racing was very tight with Rosalita, Mad Dogs and Zig Zag tied for first and Morning Glory and Emoticon tied for fourth after the first day. Sunday the postponement was a bit longer before the breeze settled in at about 5 knots. Racing was again very tight with several boats leading at some point. At the second windward mark the wind got very light and the leader Rosalita briefly got stuck in a hole and got passed by Cosmo, Morning Glory and Zig Zag. This enabled the set up for Zig Zag to win the regatta with Rosalita second and Morning Glory third. The Zig Zag crew included the entire Johansson family- including Bengt & Marie with sons Oscar & Victor and four other friends. The East Coast Championship was the third event in the 2015 East Coast Regatta series that included the mandatory National Championship at Block Island Race Week, the 2015 NOOD Regatta at Annapolis YC, and the 2015 East Coast Championship at Raritan YC. 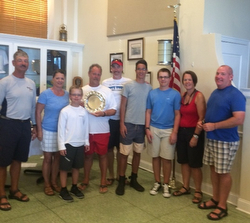 This trophy was awarded to Bill Sweetser and his Rush crew for capturing first place at the NOOD Regatta and second place at the 2015 J/109 North American Championship. In the very competitive J/105 fleet, Marcus Wunderlich's STRATOS edged out Paul Zajac's SKAL in the last reach of the last race to win the race and take home the regatta trophy by a point over Ann & Gary Myer's MAGIC. MAGIC was unbeatable the first day of the regatta, taking all the bullets. SKAL took third overall. 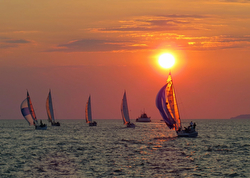 Over on Circle A, the PHRF Racing classes were sailing all together. In PHRF A1, four J/29s were sailing against a J/92— about the same length boat! Prevailing amongst the J/crews was Jim Mackevich’s J/29 FOR SAIL, finishing 4th in class. Just behind in 5th place was Tom & Julie Sinatra’s J/29 SMOKIN J and in 7th position was Sandra Gray’s J/29 MOJO. 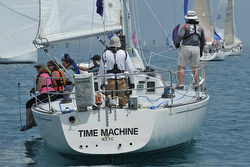 In the PHRF Day Cruiser race, it was Donna Paganos’ J/35 TEN YEARS AFTER that managed a relaxed 7th place in class. 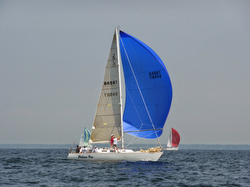 The regatta benefitted the charity Easter Seals of New Jersey and had the lead sponsor of Goslings. 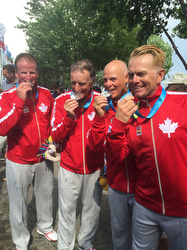 Argentina Gold @ Pan Am Games J/24 Class! (Toronto, ONT, Canada)- After six days of intense competition, the highly anticipated sailing finals took place in the inner harbour in front of downtown Toronto’s most popular urban beaches— Sugar Beach. Set against Toronto’s skyline, spectators cheered in particular for their hometown favorite, Terry McLaughlin, who was sailing in the J/24 class series. In the end, McLaughlin’s fourth in the J-24 medal race Sunday enabled his team to claim the silver medal on the final day of the sailing regatta at the XVII Pan American Games in Toronto. 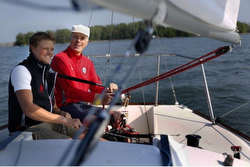 Sailing off the Royal Canadian Yacht Club, McLaughlin, a graduate of Queen’s University and silver medalist in Flying Dutchman class at the 1984 Olympics, ended the 13-race competition with 39 points, 12 points behind gold medalist Matias Pereira of Argentina. The Argentineans’ gold-medal winning team consisted of the skipper Pereira, Guillermo Bellinotto, Federico Ambrus and Juan Pereyra. Pereira, who won half of the 12 races in the preliminary series, was third in Sunday’s final race, which was won by Brazil’s John Spear King. It was the only win of the regatta for Spear King, who finished fifth overall. Matias Seguel of Chile, who closed to within striking distance of McLaughlin with four consecutive top-two finishes on Thursday and Friday, was fifth Sunday to maintain his position for the bronze medal. (Cowes, Isle of Wight, England)- This year the Royal Yacht Squadron, founded in 1815, achieves its bicentenary. To mark the occasion, the Squadron is hosting an invitational regatta to bring together as many clubs and friends as possible from around the globe, who share their common interests and love of sailing. The event takes place from the 25th - 31st July. The RYS has planned a week of challenging on the water activities and numerous spectacular social gatherings to complement them. These will take place in the evenings after the sailing has finished both at the Castle and other notable venues nearby. There are different sailing events planned to both attract and test the many disciplines enjoyed by sailors. Twenty-five yacht clubs have been invited to take part and will join the Royal Yacht Squadron for five days of spectacular racing in a 200-strong fleet, including modern and classic boats racing under IRC, J/70s, and up to five J-Class yachts. “Our aim is to make sure owners and crews will leave at the end of the event with many happy memories. Participation in the International Bicentennial Regatta will help forge stronger ties between our clubs,” commented Chris Sharples, the RYS Commodore. Founded on June 1st 1815 at the Thatched House Tavern in St James Street London, the Squadron was originally called “The Yacht Club”. It attracted royal patronage in 1817 when the Prince Regent, later King George IV, became a member. In 1833, King William IV renamed the club “The Royal Yacht Squadron” (R.Y.S.) declaring his “gracious approval of an institution of such national utility” for its role in supporting the Royal Navy and the maritime trades of Britain. Queen Victoria’s husband Prince Albert became Patron of the R.Y.S, and his son, the Prince of Wales, was Commodore for 18 years (1882-1900). King George V, also a keen yachtsman, was Admiral of the Squadron throughout his reign. The present Admiral, HRH the Duke of Edinburgh, was Commodore from 1961 to 1968. Throughout its 200 years, the Squadron’s contribution to yachting has been unique, starting with its role as the leading club in the establishment of sailing as a sport in the years 1815-1850. The 1851 race for the 100 Sovereign Cup– later renamed the “America’s Cup”– was organized by the Squadron, as were several later challenges. The Squadron, through its affiliate Royal Yacht Squadron Racing Ltd, is making a new attempt to win the cup in 2017 with a team led by Sir Ben Ainslie. In the 19th century, Cowes became a “home” of the British sport of sailing (like Lords, Wimbledon, Newmarket or Henley). It was also the center of the European social world during regatta week, particularly in the years 1850-1914. The RYS continues to play a leading role in Cowes Week and other local regattas that make a much needed financial contribution to the Isle of Wight economy. In recent years, the Squadron has placed greater emphasis on encouraging younger sailors through its April Training Week in J/109s for those aged 16 to 20 and the RYS Sailing Academy program for those aged up to 30 using the new fleet of J/70s. To create a lasting legacy as part of the bicentenary celebrations in 2015, the Squadron members are contributing to a new charity, The RYS Isle of Wight Foundation. The charity will provide financial assistance to educate and train young individuals who live on the Isle of Wight and seek a career connected with the marine industry. As part of the Bicentenary Regatta, the fleet of new J/70s will be used for 2-on-2 team racing- a very exciting form of team racing since “last loses” every time. The confirmed list of entries in this particular event include the host RYS team, the New York YC, Germany’s Norddeutscher Regatta Verein, the Royal Ocean Racing Club, the Royal Southern YC, the Royal Thames YC, St Francis YC from San Francisco, CA, the YC Costa Smeralda from Porto Cervo, Sardinia, the YC de France and also Oxford University. On the IRC fleet racing side of things, there are 35 boats representing the 25 invited clubs. 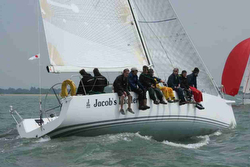 The Royal Hong Kong YC entry is the chartered J/122 JACOBS LADDER sailed by a team of RHKYC members. They are led by J/109 WHISKEY JACK owner Nick Southward, a boat with a reputation as a strong competitor in regattas and races in the waters off Hong Kong and Southern China and in the South China Sea. J/70 Europeans @ YC Monaco! (Riva del Garda, Italy)- Ever since the J/70 made its European debut at the 2013 Eurocup - held on gorgeous Lake Garda in Italy - the event has become increasingly popular not only with the local fleet, but also with a growing number of boats from all around Europe. You could say, the Garda "wind farm" is getting ready for the final act of J/70 Alcatel OneTouch Italian Trophy! The 2015 edition will take place from 9th to 12th September at Fraglia Vela Riva, the first Italian yacht club to believe in the great new J sportboat, designed by Alan Johnstone. Right from the beginning, Fraglia Vela Riva introduced the J/70 class to an international event on its calendar over the past two years. As a result, that means J/70s are destined to become THE European one-design sportboat of the current millennium! 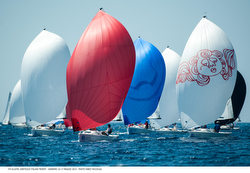 Now, Lake Garda gets ready for the third edition of the J/70 international regatta. Indeed, following the success of last year’s J/70 European Championship on Lake Garda, this year many entries are expected with top Olympic & World Champion sailors participating from France, Germany, Sweden, Norway, Switzerland, Great Britain, Spain, Slovenia, Monaco and Italy to challenge for the overall spot of the event that marks the final act of the circuit J/70 Alcatel OneTouch Italian Trophy. You can find the EuroCup NOR/ Registration here. 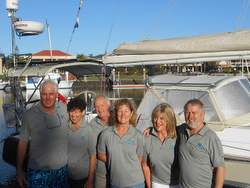 Tres Amigos Sailing Australia- Sail to Noumea! (Noumea, New Caledonia, South Pacific)- Here’s a picture of happiness. 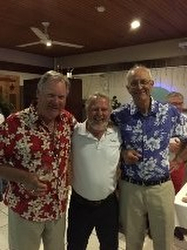 Three happy J/Boat owners at the end of a hard, on-the-wind, slog from Brisbane to Noumea in the Royal Queensland Yacht Squadron & Cercle Nautique Caledonien "Sail Noumea 2015" race that started on 20th June. Left to right are: Chris Morgan- J/130 RAGTIME; Stephen Everett- J/160 SALACIA; Tony Love- J/133 PATRIOT. “Ragtime had a bad start spending time on a sand bank just after dark going out of the bay whilst giving a big ship room to navigate the channel then by the time we got to the turning mark off Caloundra to head out to Noumea the wind had come in from the Southeast at 20 to 30 knots forward of beam and was to remain like that for the rest of the race. The first night out was shocking as we were concerned that we may have some damage from the grounding and the sea was very confused with lots of water over the deck and the majority of us were sea sick. At one stage we backed right off just sailing on No 3 headsail and checking the boat over thoroughly. Early in the evening we passed two of the "Big Boys' "Alive" and the Volvo 70 "Mates for Mates" returning to Brisbane with gear failure. By 6.00 am we had two reefs in the main. No 3 headsail and a small staysail up punching into big seas at 45 to 50 apparent at 9 to 10 knots - Great sailing and we then settled into a routine for the next four days going from one reef to two and back. The boat handled it very well and down below off watch it was very comfortable and warm the only issues being that we were taking water in through the prodder opening and chain locker. As the boat was leaning over to port the water would not drain to the keel to be handled by the pump so it accumulated under the nav table and we had to constantly sponge it up at about a bucket an hour all the way. We also broke the toilet seat, the toilet door and two spokes off the wheel. Just getting wet weather gear on and of was a big exercise when the boat is at a 30 to 40 degree angle in big seas. About a day and a half from Noumea we started the motor to charge the power up and realized that we were not getting any charge from the alternator (Water under the nav table had got to the charger box) so we ran that night in "stealth mode" to conserve power with a torch light over the compass. Very pleasant sailing without the distraction of the instruments. As darkness fell on the fourth day we spotted "Amedee Light" which marks the entrance to the reef off Noumea and we were able to use the lap top and "Expedition" to navigate. About this time the wind picked up - Not sure to what as we had the instruments off but guess about 40 K and very shifty and heading us so we had to put in a few tacks to get lined up with the Amedee Light leads loosing about 2 hours (If only we had stayed further south on the last day we would have been in 2 hours earlier and perhaps we would not have had to give "Patriot" a bottle of "Skippers Quality Rum"). The lead lights were vey good but even with the confidence of the computer it was a bit nerve racking running in at a reef with a 750 meter entrance in the dark at 12 + knots. Once in it was a nice run following the greens down the channel to the finish just before midnight. Upon arrival, we were meet by a large group and our "God Father" presented us with a basket of bread, Cheese, French wine and Beer. The Party was still going when the sun came up! Our "God Father" and the CNC were great and organized for the wheel to go off to the welders and had an electrician on the boat within hours of or arrival who replaced the charger unit and the alternator. All boats were in the same position requiring some sort of repair but nothing was too much trouble to the CNC club members getting all our boats seaworthy again within a few days. “Day 1- Departed Raby Bay 0915 in clear skies and sunshine following a streamlined clearance from friendly Customs and Border Control staff who kindly came to the Everett residence to clear all crew for departure – what an efficient service! Salacia, Skipper and crew left the home shores, waved onwards by family and friends on Cleveland Point. With little wind around, an excited crew hoisted the Mainsail and the journey began with motor sailing towards Moreton Island with pods of dolphins happily swimming along side to take us out to the North East Channel. We cleared NE Marker 2 at 1400 then turned towards Noumea with another pod of speckled dolphins swimming off our bow and leading us into the blue waters of the Pacific Ocean. Following a superb dinner of chicken and mushrooms, compliments of Di, and with crystal clear blue water beneath us, a WSW wind of 10-15 knots filling the Main and poled Jib we happily sailed into the night with a blanket of stars above us – spectacular! Day 2- After an uneventful night at the helm for all of the shifts the happy crew gathered in the cockpit to watch the glorious sunrise of a new day over a hot, fresh coffee and a quick debrief before some headed to bed, some to shower and others on watch again. Salacia’s routine for the crew for the duration of the crossing had begun and all aboard had settled into the first 24 hours very well. A magnificent, sparkly day in front of us with pods of dolphins welcoming us into this new day and their Pacific home. We continued the sail rig with gusts up to 23 knots and good boat speed between 9-12 knots and variable currents after strong southerly current off the east coast. Salacia performing beautifully - we are sailing the blue waters and no land to see! Yah!! Day 3- The glorious break of day greets the contented crew. All had some rest during the night thanks in part to the lightening of weather conditions overnight easing to 10-15 knots and moving SSW. This was followed by a hearty brunch of eye fillet sandwiches, with brandy and cream sauce – well Salacia is “dry” for the crossing so a little tempting taste of what we can have when we arrive in Noumea, a wee tipple or two, keeps the Skipper and crew amused and content to wait for the arrival in Noumea! Sure all the livers aboard are happy they too are enjoying a holiday of fresh air and water!? In the midst of the female crew, busy with rags polishing the cockpit, comes excitement down below: “time to raise the Spinnaker”! All hands on deck and up she goes! A few hours later, the wind drops out again and down she comes, fun while it lasted! Not long before the setting of the sun on another glorious day and we are thrilled by the sighting of a migrating whale to our port side as we come over the sea mount of Capel Bank, only 50 metres of water below us after over 5,000 metres of deep water…. the trawling line just may go out as we go over the Bank! Day 4- Finishing the 0200 shift on deck the fortunate crew hit the pillows with the sound of rain falling on deck and the next round of crew dealing with mild conditions and rain. Oh well, Salacia had a wash down too! The early morning greeted crew with fluffy clouds over the far eastern horizon hiding the break of day however a low flying albatross swooped and dived over the stunning deep violet blue waves and flew alongside Salacia enjoying the company, but perhaps more the thought of catching the spectacular silver and blue flying fish coming out of the big southern swells. It was another glorious start to the day for all on board. The southerly arrived and with it some great winds giving Salacia her task to ride the great southern swells and 15-20 knot winds. Great helming by Skipper, Ross and Ron and superb sail trimming, ensured we made great miles today – well done boys! The swells and wind created a washing machine feel in the galley and caused some trials and tribulations, not to be outdone the galley girls proceeded with the menu of French scrambled eggs on home made toast with grilled organic bacon and oven baked, vine ripened tomatoes with balsamic vinegar … sound good enough to eat for a hungry crew? Well Salacia thought so too! A rogue wave hit the starboard side just as the 14 or so organic eggs and half litre of cream were all whipped and ready for the pan! The bowl remained in the sink; the egg mixture flew over the entire fridge, freezer and louvered timber doors! The expletives just may have been heard in Brisbane! The helmsman got the message and lightened off the mainsail and from the remaining egg cache the mixture had to be re-done to ensure a great brunch could be enjoyed by all …. sorry to say Noumea customs we will have no eggs to pass in!! Credit where credit is due the great helmsman of the moment spent over an hour emptying fridge, freezer and cupboards for the mammoth clean up! A stunning day finished off with Sand Crab Lasagna compliments of Cherie who is on a holiday of her own in USA! No hiccups in the galley tonight! Day 5- Strong breezes afforded a very fast sail overnight with two sail reaching and the first sight this morning was not a whale, dolphins or an albatross but alas Beau Geste around 5 nautical miles to our port side and passing us doing at least 20 knots! What a sight…she will achieve line honours at the very least and perhaps race record, well earned and well sailed! With only 100 nautical miles to go all crew are enthusiastic about arriving into safe harbor later this evening and passing the finishing line that has been marked on the electronic chart with a blue cocktail glass! Think the Skipper is pre warning all what may lay ahead after a dry crossing! Around 70 nautical miles from the finish line and the Pacific Ocean gave us a taste of what it is capable of - big solid swells and 32 plus knot winds! Salacia sailed through with great helmsman ship from the Skipper, Ross & Ron …. well done boys you rose to the challenge! 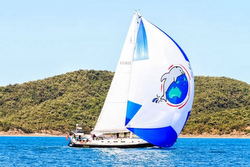 Salacia and her crew sailed across the finish line at 2304 Australian Eastern Standard time and were greeted by a Zodiac with officials from Cercle Nautique Caledonien/Noumea Yacht Club. They kindly escorted us to our protected berth and we welcomed aboard the Race Officials and members of the Club who handed us a huge bag filled with French fare including but not limited to baguettes, cheeses, salamis, Bordeaux wines and French beer…what an incredible welcome at the early hours of the morning! (Youngstown, NY)- The Youngstown Yacht Club will be hosting the 2nd Annual CanAm Challenge July 25 & 26th. The regatta is open to all boats. Any class that has 5 registered boats will compete as a One Design Class, and boats without a One Design Class will compete in a series of 2 Pursuit Races. The CanAm Challenge is a competition of the boats individually but also to defend their nation. In 2014, Canada was victorious, but 2015 is a whole new year. Who will win? On shore, activities will include live music, a street hockey competition, and a chicken dinner for competitors! The regatta has strengthened considerably and grown tremendously in the past year since the inaugural event in 2014. The event now features one-design classes of J/22s, J/24s, J/70s, J/27s, J/88s and J/105s. For the latter two, it’s the Great Lakes Championships for both the J/88 and the J/105. The J/88 class will see its largest gathering of boats in a one-design event to date with eight boats on the starting line. In their on-going duel that started in Key West and continued in Charleston Race Week, we find Iris Vogel’s DEVIATION crew from Huguenot YC up against Rob & Sandy Butler’s pink & grey themed TOUCH2PLAY RACING from Hamilton Harbor YC in Hamilton, Ontario. They are facing a number of new and veteran teams such as Laura Weyler’s DEBUT 88, Joe & Jeff Pawlowski’s EASY EIGHTS, Rich Lohr’s NIGHT OWL, John Frank’s RUMBLE BEE, Don Finkle’s SEAWEED and Joe O’Brien’s SQUIRMY. With nineteen boats, the J/70s are easily the largest class at the regatta with a nice mix of familiar veterans coming up against new teams. Tim Finkle’s Junior, Corbo Corbishley’s LATE LIFE CRISIS, Morgan Paxhia’s PENNY PINCHER, Marty McKenna’s RARITY, Tom Bowen’s REACH AROUND, Scott Weakley’s REX and Kristofer Werner’s SUPERFECTA should be on fire somewhere near the front of the fleet. Teams have come from as far as San Francisco, CA; Vienna, VA; Charleston, SC and Stonington, CT to enjoy the pretty sailing at the western end of Lake Ontario (right next to Niagara Falls!). As a J/22 stronghold for decades, it’s not surprising to see a very competitive turnout of thirteen J/22s for the regatta. While missing one of the Doyle clan to the J/22 Worlds about to start in Travemunde, Germany, none other than Travis Odenbach from Rochester YC will be sailing QUANTUM SAILS ROCHESTER. Stiff competition should come from Mark Stuhlmiller’s EUDAIMONIA, Vic Snyder’s MO’MONEY, Trevor Collins’ ALTERNATIVE GIRLFRIEND and Ron Harris’ BROOMSTICK. Also with a good showing is the dozen-boat J/105 fleet with just about all Royal Canadian YC teams. The local American street hockey guys better watch out for these loonies, half of them used to play Senior A or pro hockey! Fresh off his J/24 Silver Medal at the Pan Am Games will be Terry McLaughlin’s crew on MANDATE (they’re also the J/105 North American Champions in 2014). 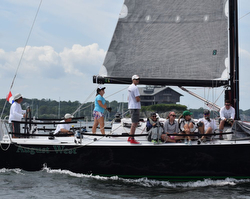 Giving them a fierce dogfight is always Jim Rathbun’s HEY JUDE (another J/105 NA Champion in Annapolis, MD). In the hunt will be Peter Hall’s JAMAICA ME CRAZY and THE USUAL SUSPECTS. On a rebound for the past few years is the local Lake Ontario J/27 fleet. This year nearly a half-dozen boats will be on the line. Past class champions like Andrew Riem’s CURVED AIR, Mike Seitz’s NORTHERN SEITZ and Andre Beese’s MESSING ABOUT will be duking it out for the gold. The J/24s will feature a 2-on-1 bout between two American teams- Gabe Lewis’ HANG LOOSE & Dave Stoller’s TBD up against the Canadian Rick Sherk on BAD HABIT from Niagara-on-the-lake, Ontario. Finally, the PHRF Pursuit races have Robert Hesse’s J/111 LAKE EFFECT, Denys Jones’ J/109 CARPE VENTUS, Paul-Angus Bark’s J/35 CRIME SCENE, John Reinhold’s J/124 FUTURES and Doug Clarke’s J/35c ROGUE WAVE all hoping to cross the finish line at the same time! Well, maybe not. But, that’s the idea! Sunny Delta-Lloyd Week Loved By All! Spain’s Tabares Repeats J/80 Worlds! Viva Mexico! Fernandez Wins J/70 Worlds! J/122 SKY HUNTER Sailing Off Portofino! Gorgeous, Epic Block Island Race Week! French Deage Family Sailing New J/111!